Brandy Elbinger is the recipient of WCE’s fall 2018 Roy E. Harkin Award for excellence as a PDS partner. Elbinger is an instructional systems specialist at Camp Lejeune Schools and site coordinator for all Watson College partnership schools in Camp Lejeune. 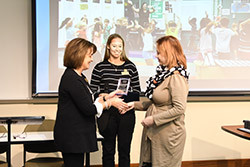 The award was presented at WCE’s PDS Partnership Teacher Celebration event, held at the Watson College on December 10. Cindy Wiseman, director of WCE’s Professional Experiences Office nominated Elbinger for the award. The Roy E. Harkin award was established in 2008 in memory of the man who served as chair of the Education Department at UNCW from 1976 to 1979 and as Dean of the School of Education until 1991. 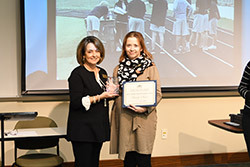 The award is given each semester to a public school partner who has contributed to the preparation of future teachers by demonstrating excellence as a partnership teacher and/or site coordinator. Family and friends of Dr. Harkin fund the award in recognition of his commitment to partnerships with public schools and his appreciation for the contributions of public school educators to teacher education programs and the preparation of prospective teachers.